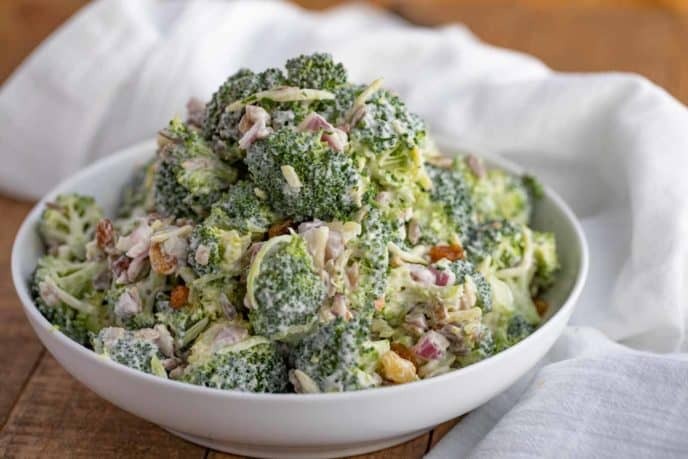 Broccoli Salad is an easy summer salad with raisins, bacon and sunflower seeds for your barbecues, picnics, and summer potlucks that can sit without wilting! 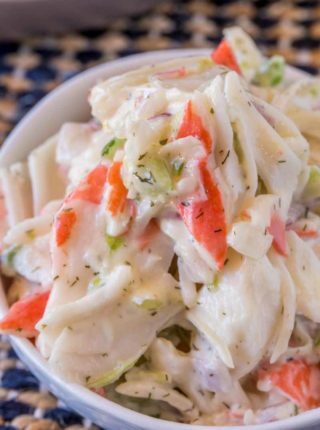 There’s always a potluck going on in the summertime, and we have the perfect recipes for you to pack like Cole Slaw, Macaroni Salad, Crab Salad (Seafood Salad), and Baked Beans! Broccoli Salad is one of my go-to cold salad side dish recipes, right next to my favorite Potato Salad. It’s made with fresh broccoli (broccoli florets), red onion, raisins, and sunflower seeds mixed with seasoned mayonnaise and topped with crispy crumbled bacon. Broccoli salad is quick and you’ll enjoy it all summer long, and even get the kids to enjoy eating broccoli! This broccoli salad recipe needs almost no prep time, and in fact takes a total time of five minutes to throw together. I like to refrigerate the salad, because it tastes better cold and it gives all of the flavors a chance to come together. 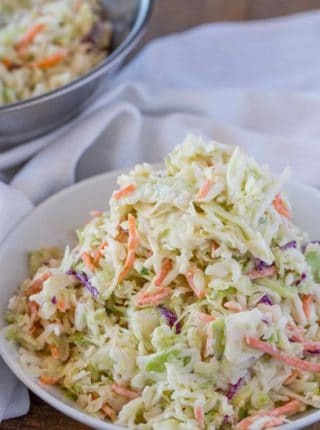 If you love broccoli salad and you’re looking for more summer side dishes and summer salad recipes be sure to stay tuned, we are heading full speed ahead with summer friendly food items everyone will love! If you’re looking for other great side dish potluck recipes, check out my Tuna Salad, Chicken Salad, and Egg Salad! Swap your sunflower seeds for chopped pecans, walnuts, or almonds. Add in some chicken for an easy and quick filling lunch option. Squeeze in some lemon juice and add lemon zest to the dressing. You can easily swap out golden raisins for the regular variety or for dried cranberries. If you don’t like raisins you can substitute red grapes cut in half. You can use regular onion instead of red onion, for a stronger flavor. Mix in half cauliflower and half broccoli for another spin on this recipe. CAN YOU MAKE BROCCOLI SALAD AHEAD? You can make broccoli salad ahead of time, and the flavor of the dressing even gets better as it sits in the refrigerator. But we’re still making it with fresh broccoli florets so I try to only make it at most 24 hours before I’ll be serving it. This is actually one of the best things about broccoli salad. You can enjoy greens without worrying about how they’ll fare sitting out while being dressed. Plus getting people to eat broccoli that is raw is not a challenge when you make this amazing salad! HOW LONG WILL BROCCOLI SALAD KEEP? Broccoli salad will keep for 3-4 days, when tightly sealed in the refrigerator. I don’t recommend freezing broccoli salad because the mayo will not look good once it’s defrosted. You can use apple cider vinegar or red wine vinegar instead of white vinegar if that’s what you have, either one will work. Apple cider vinegar will have a slightly different flavor than white vinegar. This salad can be put together in just five minutes if you buy pre-crumbed bacon. If you do buy some, make sure to microwave your bacon for ten seconds on a paper towel to crisp it back up. You can also add 1/2 cup of shredded cheddar cheese to this salad for a different variation. 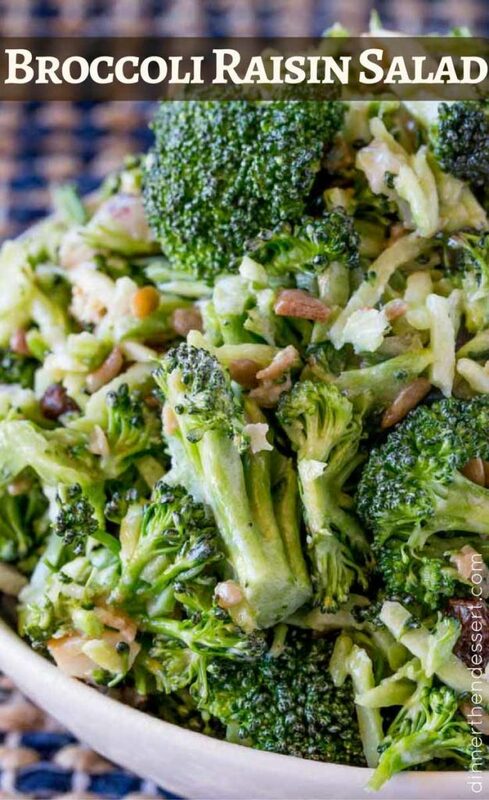 This healthy broccoli salad is naturally gluten free and low carb. You can also make this easy broccoli salad low fat by swapping the mayonnaise for either light mayo or plain greek yogurt (or a mix of mayo and greek yogurt), and use turkey bacon instead of regular. 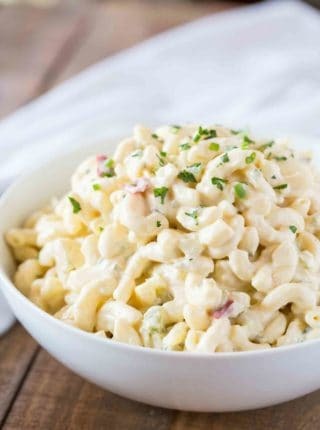 You can also make this more creamy by mixing it with half sour cream and half mayonnaise. Make this broccoli salad recipe even faster by buying pre-cut vegetables, and whisking together the dressing the night before. 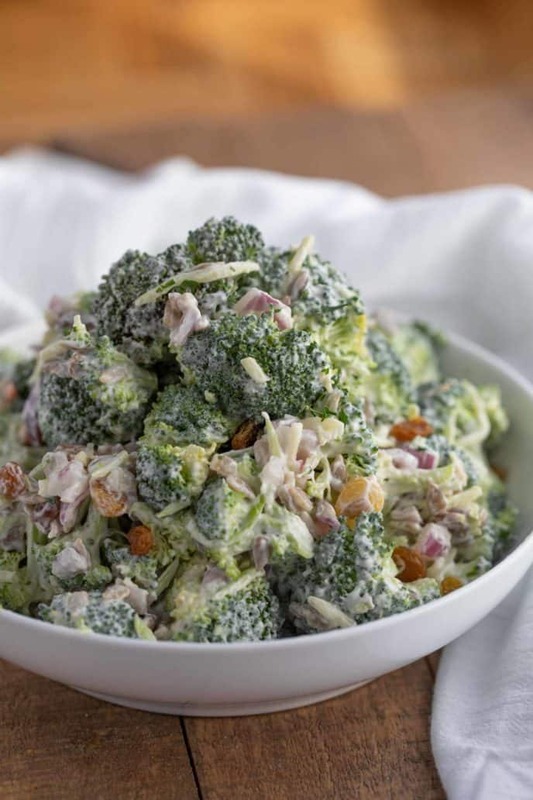 I don’t recommend using frozen broccoli for this broccoli salad because it’s already blanched before it’s frozen, so it won’t have the same crunch that you’d get from fresh broccoli. If you want a softer broccoli to start with instead of crunchy, blanch the raw broccoli quickly and drain it completely before mixing everything together. Chop the onion faster by pulsing it in the food processor. Make sure to cut everything into bite sized pieces, to make the broccoli salad look more uniform. Making everything bite-size will also help make the salad easier to eat. 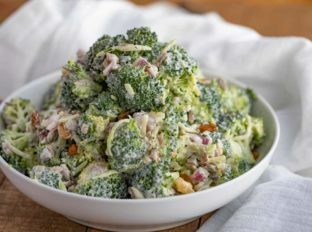 If you want this broccoli salad recipe to have a crunch to it, stir in some nuts or seeds right before serving, because the broccoli itself will soften the longer it sits in the dressing. In a very large bowl mix the mayonnaise, sugar, white vinegar, Kosher salt and black pepper. Add in the broccoli, red onion and raisins into the bowl and mix. Top with the bacon and the sunflower seeds. Mix broccoli, bacon, red onion, and raisins in a bowl. Leave in the refrigerator for at least an hour, preferably 2 hours. Very easy to make and very very good!! Thanks, Carolynn! I appreciate the 5 star rating. I made it tonight using Hellman’s and Blue Plate mayonnaise. The sauce by itself was wonderful, but I could have used 1/4 to 1/2 cup more dressing. I doubled the recipe and used 1 1/4 cup seedless raisins, 3/4 cup dried cranberries and added cashews instead of sunflower seeds. I don’t know how it would have been if I hadn’t used the cranberries. It was good but too sweet. Thank you for posting the recipe. Before I saw this, I was guessing. By the time I figured out how to get the taste right, the dressing would be too thin and too much of it. This is perfect to step up my barbecue hosting!! Am going to try it out for Memorial Day wkend! Thanks! This looks so tasty and fresh for Summer! 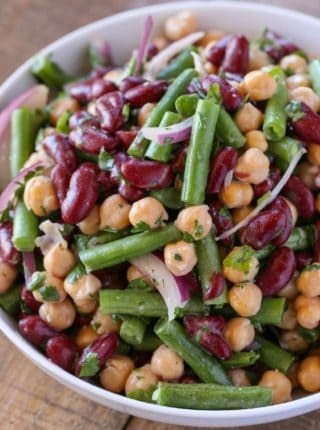 The perfect salad for picnics! Can’t wait for some warmer weather. Thanks Erin! Bring on summer!! My girls would love this! They love anything with a subtle sweetness! Any dish that everyone will eat is always a win for me! I’m ready for summer! I’d love to take this salad to my next potluck! YUM! What a salad! Broccoli and raisins are two of my daughter’s favorite things, so I know she’s gonna love this recipe this summer. This would be a great dish to take to a picnic or potluck!